My initial concern about the project is how it only appears to appeal to upper class consumers. I believe this to be true because there is no affordable housing and the shopping is high end stores such as Apple, Anthropoligie, and Brooks Brothers. The article in the Salt Lake City Tribune describes the stores in the mall as “luxury and mid range.” However, the question posed in Mary’s article is how the mall contributes to Salt Lake City being an engine of biodiversity not an engine of social equality. Another thing to consider is that the project was privately funded so they really don’t have that much of a responsibility to be socially conscientious. While the center sets up the possibility of Salt Lake City being an engine of biodiversity, it has only made the first step. 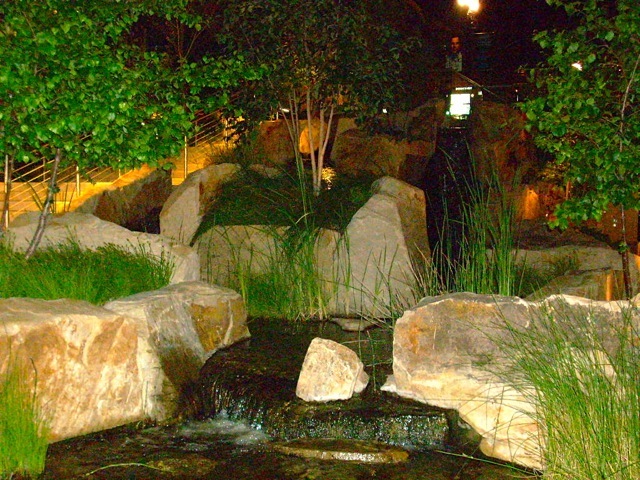 The center must go beyond just providing a pretty setting where people may think “oh what a pretty creek,” or “what a nice place to shop.” The center must go further and make people interact with the nature. This can be accomplished by allowing people the opportunity on site to purchase plants that they can take home with them or providing naturescaping classes as Mary suggests. In addition to the positive shopping experience where people can simultaneously appreciate nature, there needs to be a take home message. This second layer is especially important when the center uses a lot of water and power. To make Salt Lake Center an engine of biodiversity, this interactive step must be taken. Some other interactive ideas in addition to plant sales and naturescaping classes could include nature classes for children while parents shop. Or perhaps each store in the mall could offer different tips on how to be sustainable and provide an example. Independent of these educational possibilities, the City Creek Center could also include plants (preferably native) that can collect and treat stormwater runoff from the street. Thanks so much for your comment, Carolyn! Efforts to reverse the abandonment of downtowns seem to emphasize market rate and luxury housing in order to diversify what have become low-income enclaves–not necessarily a bad thing. Salt Lake City developers seem to have been developing a diverse palette of dense housing close to downtown for awhile, so there do seem to be opportunities for different income levels to live near City Creek Center. The Center also seems to attract plenty of people who aren’t wealthy–including teens and 20-somethings who use it to hang out and socialize. But, you’re right, I was trying to assess whether the engineered landscape was an engine leading to greater biodiversity in the city as a whole. Like you, I’m concerned about the water and energy usage of the landscape, so, I suggested ways the developers could mitigate that usage by suggesting other projects that could both lower their water and energy footprint while contributing to biodiversity. Restoring a natural meandering stream channel in City Creek Park that could feed a wetland or two and partnering on a biodiversity management plan for the Brown’s Canyon quarry were two ideas I had. Apparently, the fish in the Center’s streams are quite popular with children, so there has been some pressure to have interpretive programs around them. I had the opportunity to tour the “mall” during my attendance at CNU 21. I have two thoughts on the development. I think that it is a very well designed project. 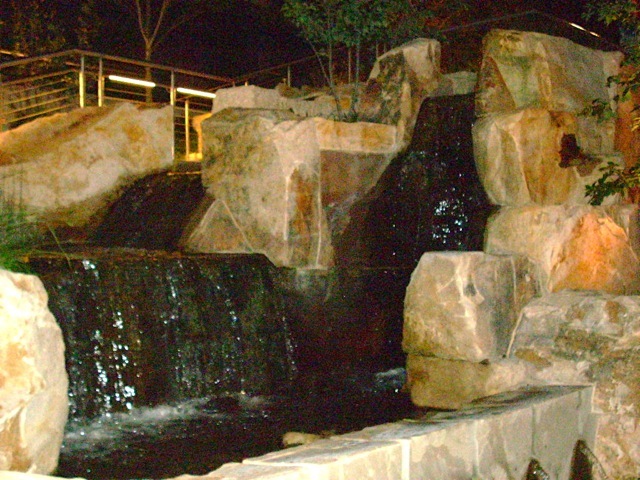 The detailing and the materials that were used in the creek are second to none and the overall appearance for a man made stream is very good. I’m sure that it will be well taken care of and as the plant materials grow it will become a much more natural appearing feature. I think what it does first and foremost is to bring the importance of nature and natural systems to many people who would otherwise not take notice of. I saw many people looking at the fish, examining the plants, enjoying the waterfalls and just sitting under the shade and enjoying the space and surroundings. I think that spaces such as this will help to illustrate nature and instill a feeling in people, a feeling of “how cool nature in the city is” This is a space that will be talked about after people leave. For a contrived landscape, this was done very well. As an engine of Biodiversity? Looking at the creek alone, i think that there are many positives but it may fall short on many fronts such as: the use of potable water and the systems used to ensure clean water, the fish habitat, their longevity and I imagine a continuous stocking of the trout in the creek, the use of the creek as a grey water collection and drainage system? signs that say” do not climb on the rocks or play in the water (or something to that effect thus creating a do not touch landscape). I don’t think that we would ever see frogs, toads or snakes crawling around in front of Macy’s because that would be bad for business. As Carolyn said there are many opportunities to make this much more interactive and a way to teach the young and curious about nature etc. This is where they could have really taken this to the next level. Don’t misunderstand me, I’m not slagging the development because I think it is very well done and a lot better than many attempts to create man made “natural” environments especially within the context of a downtown shopping mall. I think that it is important that we continue to keep pushing the limits of design so that we can really and truly try to integrate nature into our psyche and built environment and we really have to start thinking of the long term benefits versus short term gain. As a shopping mall I’d give it a 10, as a engine of biodiversity? 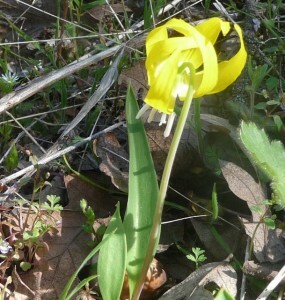 it is more like a token of Biodiversity. 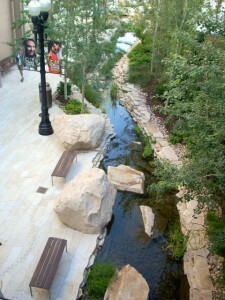 Did you happen to see the engineered creek along the other side of South Temple–across from City Creek Center? It looked a bit older than those in City Creek Center offering a natural reprieve to the busy street. However, it is here in the street right-of-way, especially, where filtering of stormwater by native plants might take place. Stormwater may be a less frequent issue in Salt Lake City than in the Pacific Northwest, but it sure was a problem the day before CNU 21 started. I had to walk around or through many small ponds. Interestingly, my outdoor gear got a better wet weather test that day than in the PNW! What would you think of the suggestion that City Creek Center work with the City to create natural spaces on the streets around the center that DO filter stormwater–i.e, arid land bioswales/green streets? 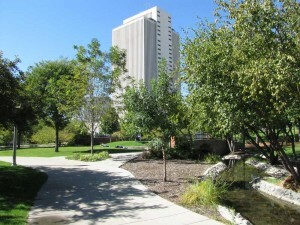 And what about the suggestion to mitigate by dealing with the most urban portion of City Creek? Yes, I did see the engineered creek. It is another unique feature although I wasn’t sure if it was more for aesthetics or if it served a more functional purpose. I did notice a healthy flow of water during the days that it was dry. so I assumed that it again was using recirculated water to create the stream effect? It too was well done. One of the most interesting examples of using runoff I saw was in Seattle where the troughs from buildings were directed to the blvd. and into public art features used for controlling runoff and watering the vegetation (not that they need it). As designers we should all be stretching our imaginations to incorporate unique and functional elements such as this wherever we can (and in many shapes and forms). The width of the streets in SLC are perfect for creating islands of “indigenous” landscapes to help reduce the asphalt expanse and then some! We have to get over the thinking that the R.O.W. is just for cars! If I remember correctly, the LDS/City, could have done this above the entrances to the underground parking for City Creek. 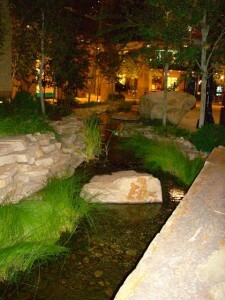 No, City Creek Center is not an engine of biodiversity. I think Dave expressed it well as tokenism. A better example in SLC is the green roof atop the LDS Conference Center. Thanks for your comment! I would love to hear more about the green roof. Is it new? Can you give us a URL? 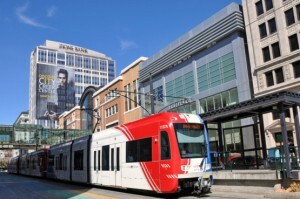 Writing about City Creek Center, Dave also said: I think what it does first and foremost is to bring the importance of nature and natural systems to many people who would otherwise not take notice of. I saw many people looking at the fish, examining the plants, enjoying the waterfalls and just sitting under the shade and enjoying the space and surroundings. I think that spaces such as this will help to illustrate nature and instill a feeling in people, a feeling of “how cool nature in the city is” This is a space that will be talked about after people leave. Do you agree with him on this? AND on the opportunity to take it to another level by becoming much more interactive a way to teach the young and curious about nature? I hope there are people in Salt Lake City who are pushing LDS to make their creek and landscape more interactive. My article pointed out that it was not perfect as an “Engine of Biodiversity”, and I tried to make some suggestions about how they could begin to mitigate their impacts to bring it to the next level. I’d love to hear your suggestions on mitigation possibilities too!